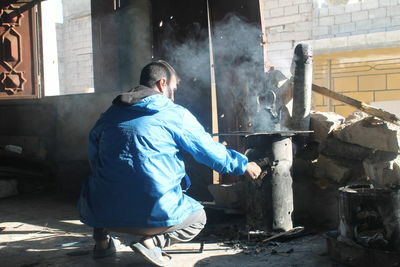 Um Abdul Rahman adds plastic and wood to burn in the stove. 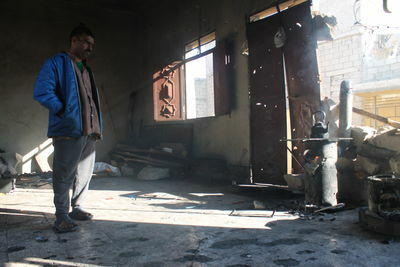 Abdul Rahman blows to fan the flames. 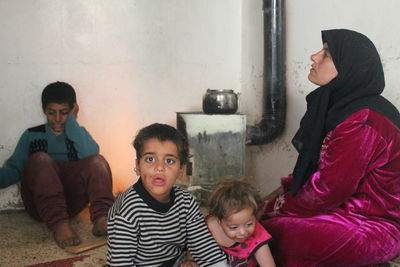 Um Abdul Rahman and three of her children sit near the stove. 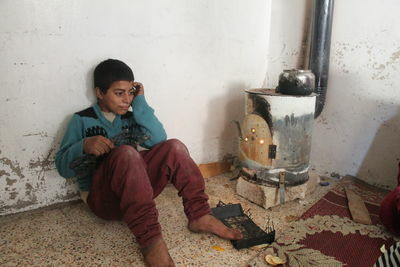 Abdul Rahman sits next to the stove with a peace of plastic to add as fuel. 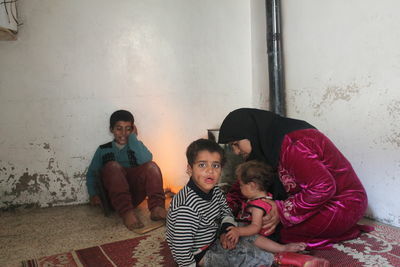 Um Abdul Rahman and two of her children sit near the stove. 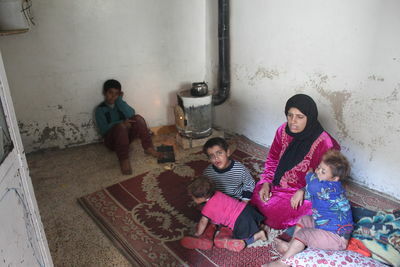 Um Abdul Rahman and four of her children sit near the stove. 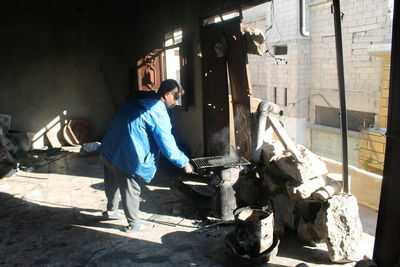 Abdul Rahman collects rubbish to burn as fuel in the stove at the family's home. 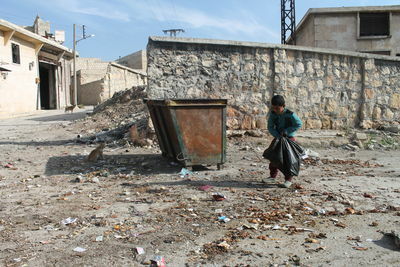 Um Abdul Rahman's young children outside the house. 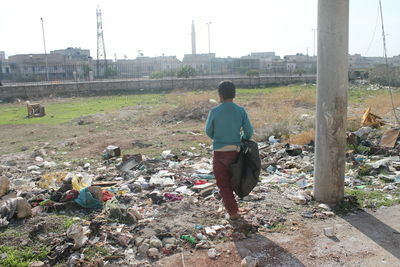 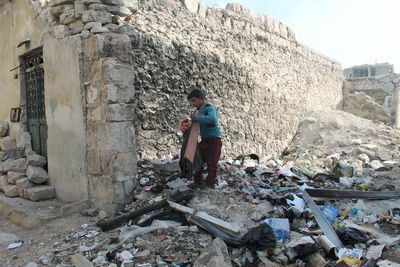 Abdul Rahman collects rubbish to burn as fuel in the stove next to a bomb damaged building. 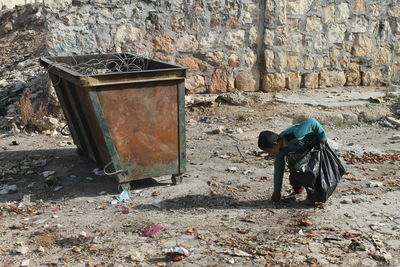 Abdul Rahman collects rubbish to burn as fuel in the stove next to a dumpster. 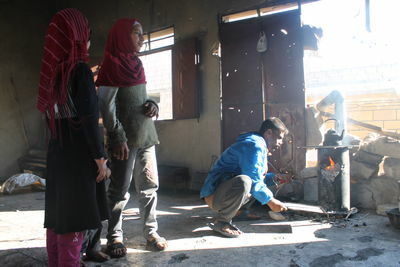 Abdul Rahman collects rubbish to burn as fuel in the stove at the family's house. 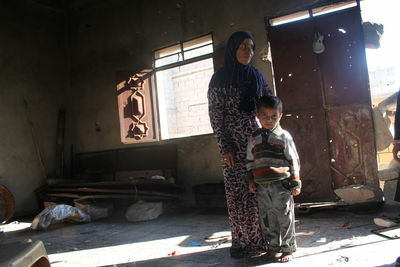 Um Abdul Rahman sits at the doorstep of her home as her son holds a peace of plastic to be burned as fuel in the stove. 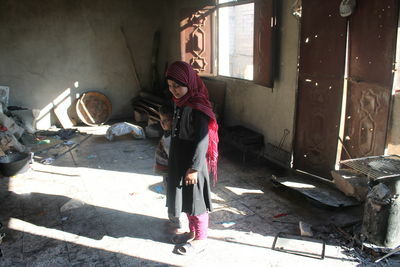 Um Abdul Rahman holds her forehead as she sits on the doorstep of her home. 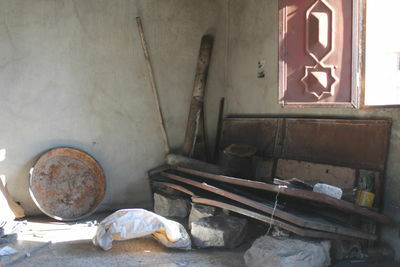 Jannud al-Saghir and two of his daughters collect rubbish that can be burned as fuel for cooking and heating. 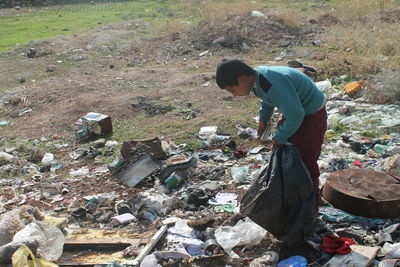 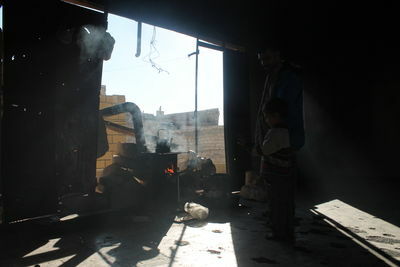 Collected rubbish that al-Saghir family burns as fuel for cooking and heating. 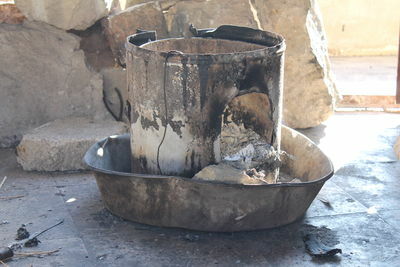 Handmade pot used to cook. 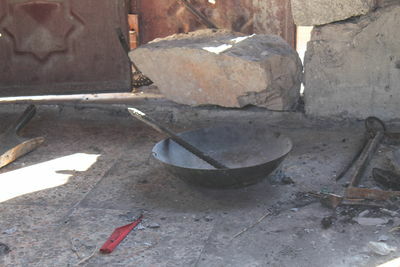 Handmade stove used for heating and cooking. 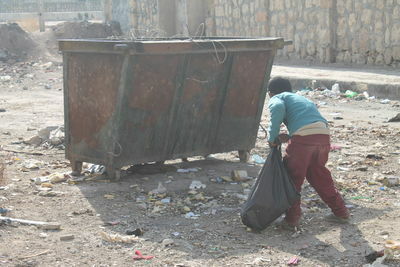 Amina and her son Mohamed. 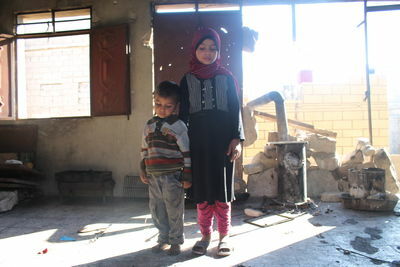 The wall behind them was damaged in the bombing of their neighborhood in Aleppo. 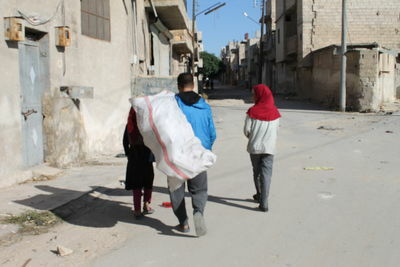 Mohamed and his sister Kawthar. 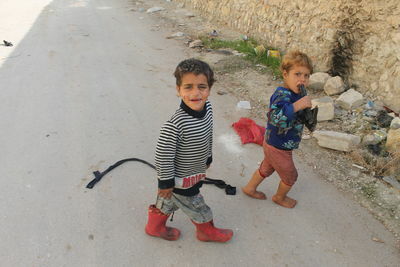 The wall behind them was damaged in the bombing of their neighborhood in Aleppo. 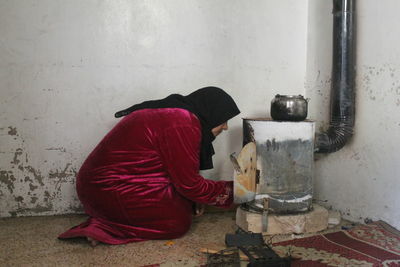 Jannud standing near the handmade stove used for heating and cooking. 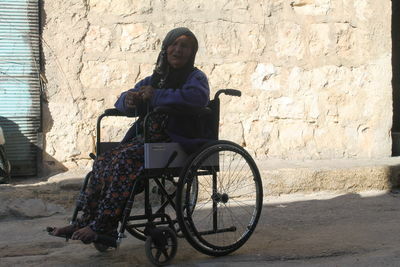 The wall of his balcony is damaged in the bombing of his neighborhood in Aleppo. 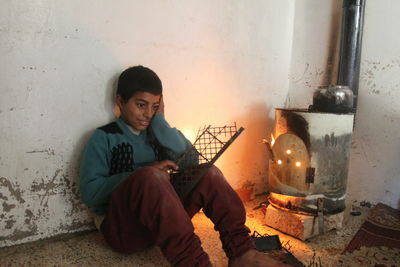 Jannud lights the handmade stove used for heating and cooking. 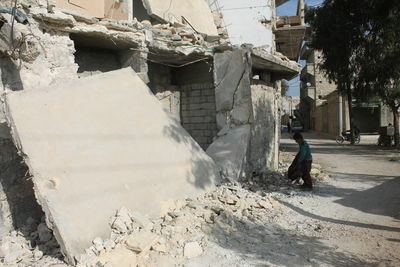 The wall of his balcony is damaged in the bombing of his neighborhood in Aleppo. 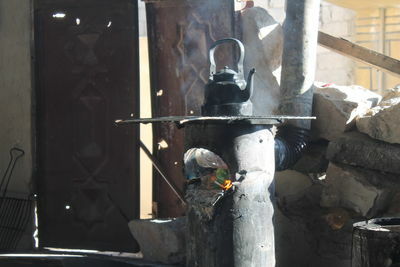 Jannud uses plastic bottles to burn as fuel in the handmade stove used for heating and cooking. 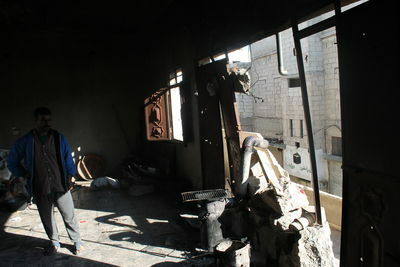 The wall of his balcony is damaged in the bombing of his neighborhood in Aleppo. 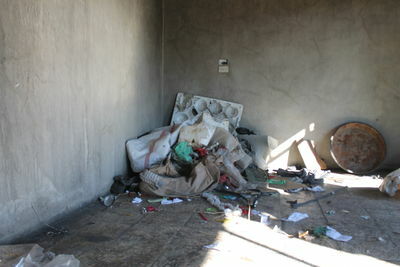 Plastic bottles burned as fuel to heat water. 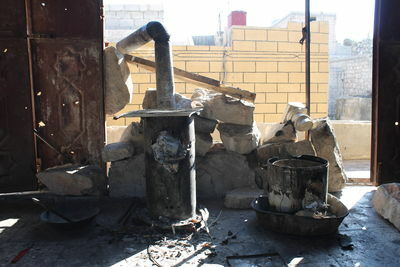 Jannud stands by the handmade stove waiting for a cattle of water to boil. 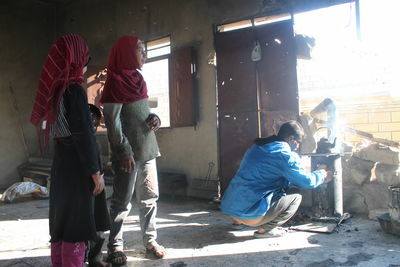 Kawthar, Areefa and little Mohamed watch as their father Jannud adds wood sticks to burn in the handmade stove. 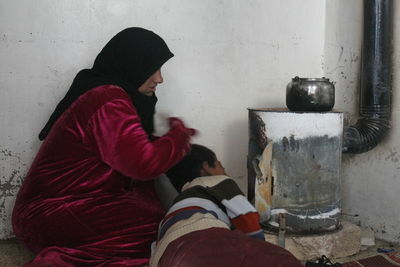 Mohamed tries to warm his hands as he and his father Jannud stand by the handmade stove waiting for a cattle of water to boil. 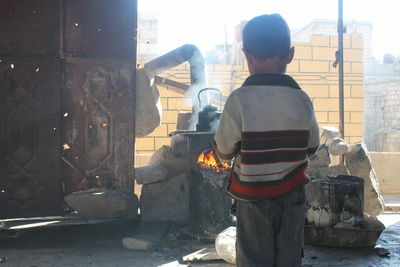 4 year old Mohamed stands in front of the handmade stove. 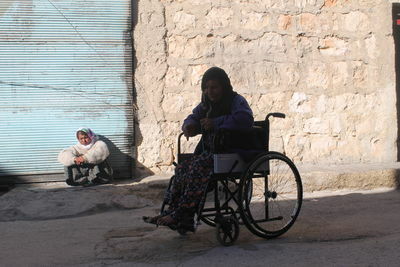 Jannud's elderly mother, Farida, is unable to walk and is confined to a wheelchair.